The daily patterns of task performance in honey bee colonies during behavioral development were studied to determine the role of circadian rhythmicity in age-related division of labor. Although it is well known that foragers exhibit robust circadian patterns of activity in both field and laboratory settings, we report that many in-hive tasks are not allocated according to a daily rhythm but rather are performed 24 h per day. Around-the-clock activity at the colony level is accomplished through the performance of some tasks by individual workers randomly with respect to time of day. Bees are initially arrhythmic with respect to task performance but develop diel rhythmicity, by increasing the occurrence of inactivity at night, prior to becoming foragers. 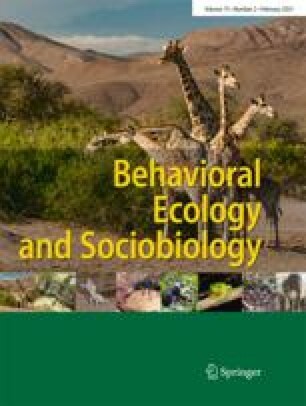 There are genotypic differences for age at onset of rhythmicity and our results suggest that these differences are correlated with genotypic variation in rate of behavioral development: genotypes of bees that progressed through the age polyethism schedule faster also acquired behavioral rhythmicity at an earlier age. The ontogeny of circadian rhythmicity in honey bee workers ensures that essential in-hive behaviors are performed around the clock but also allows the circadian clock to be engaged before the onset of foraging.